WILMINGTON — On Aug, 10, 1968, six of 27 Southern Ohio Air Force Reservists attached to the 302nd Tactical Air Wing lost their lives on a routine training mission. The C-119 Flying Boxcar they were on crash landed near SR 134 and Berlin Road, and burst into flames shortly after take-off from Clinton County Air Force Base on its way to Otis A.F.B. (Massachusetts). Today, there is a fundraising effort underway to pay for a bronze memorial plaque, to be erected at the Denver Williams Park, honoring the six men who perished in the crash. 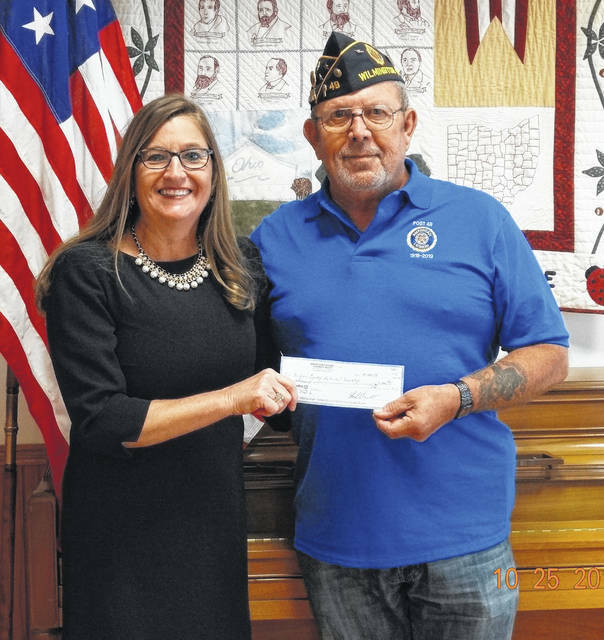 Carolyn (Cari) Hansford Middleton, daughter of William Hansford, one of the six deceased reservists, recently received a check for $1,000 from Jack Rose, of Wilmington Veterans Post 49, in support of that effort. To contribute to the construction of this memorial, checks may be made payable to the Clinton County Historical Society and mailed to: Clinton County Historical Society, 149 E. Locust St., Wilmington, OH 45177, Attn: August 1968 Plane Crash.